The University of São Paulo (USP) is a public university, maintained by the State of São Paulo and affiliated with the State Secretariat of Economic, Scientific and Technological Development. Various world rankings, created to measure the quality of universities according to various criteria, particularly those related to scientific productivity, have widely recognized the talent and dedication of USP professors, students and employees. 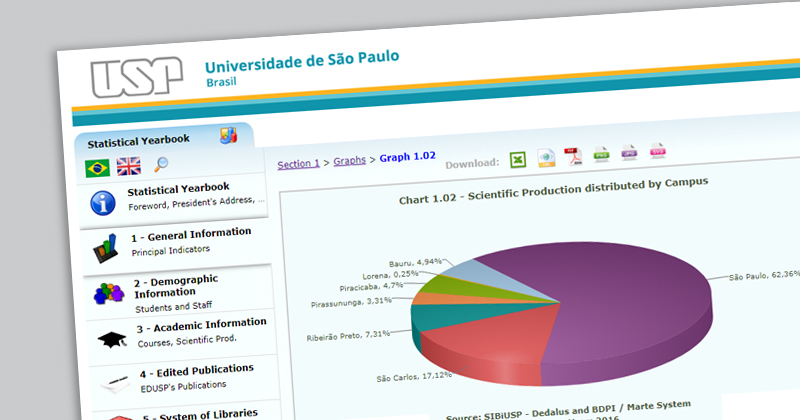 In 1987 the University of São Paulo began the publication of its Statistical Yearbook (Anuário Estatístico). Its objective was to unite and consolidate some demographic and academic statistics about the University, which would become an instrument for the support of management and planning of its academic, research and service activities.